To tell you the truth, I’m not sure why these are called Mexican Brownies. As I’m sure we all know, Cinco de Mayo is coming up tomorrow which also happens to be my client day. I am making (what else?) Mexican food and I wanted the “treat” to fit in with the theme. A quick search on Epicurious brought me here. I know Mexican chocolate has cinnamon in it and this brownie batter calls for a whopping tablespoon of the stuff. I don’t know what the topping contributes to making them Mexican. I remember reading that Latin America likes it’s desserts really sweet (how about that for a gross generalization? ), and if that is true, these should please a Latin American palate. They are very sweet. 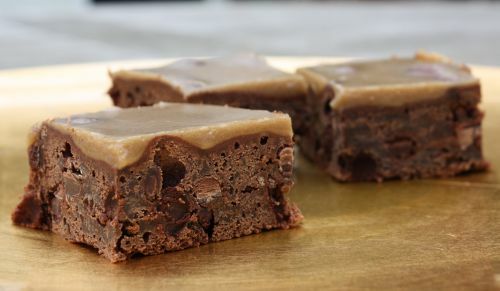 Kind of like brown sugar fudge on top of a cinnamon-y brownie. You could, of course, leave off the topping all together and have a very tasty (and incredibly easy) bar. I like sweet things but this was a little much for me. I’ll let Randy and the boys eat these and I will turn my attention to the slices of 6 layer chocolate cake that my neighbor brought over. I made a few changes here. After reading some of the comments following the recipe, I bumped up the amount of cinnamon from 1 tablespoon to 1 1/2. I also added semi-sweet chocolate chips instead of milk chocolate because I could sense these were going to be super sweet as it was. Also, I opted to leave the sliced almond topping out, because I don’t think chocolate and nuts belong together. Preheat oven to 325 degrees. Line 8-inch square baking pan with foil, extending foil over sides. Stir unsweetened chocolate and butter in heavy large saucepan over low heat until melted and smooth. Cool 5 minutes. Whisk in sugar, cinnamon, and salt. Whisk in eggs, 1 at a time, then vanilla. Continue to whisk until batter is smooth, about 2 minutes. Add flour and whisk just until blended. Stir in chocolate chips. Pour batter into prepared pan, smoothing surface. Bake until tester inserted into center comes out with a few moist crumbs attached, about 30 minutes. Cool completely in pan on rack. Using foil as aid, lift brownie from pan. 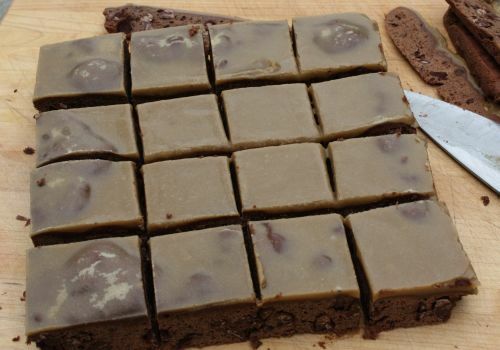 Cut brownie into 16 squares. Serve cold or at room temperature. Sweet or not, they look delicious. The brown sugar topping sounds great. Mmm those look awesome. I know you say they’re too sweet but that doesn’t stop me from wanting to try one! THey look really delicious, in general I don’t like dessert that is too sweet. So this brownies is perfect. These look gorgeous and sooo rich! Just dreamy. Thank you! Your clients are lucky to be getting a Cinco de Mayo meal from you tonight. I can only imagine what delicious things you’ll make! These brownies sound wonderful, even a little exotic. Your “sweets plus nuts” aversion is hilarious, especially since you don’t eat the nut torte you made at Christmas. At least you get positive feedback to tell you how tasty it is. These look fabulous! in fact it was really cruel of you to post these little pieces of heaven. You are making me want to cry! looks sooo decadent and yummy! 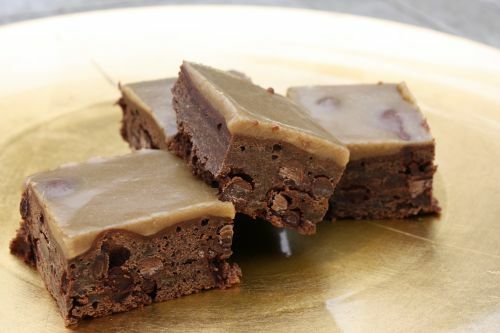 I found these lovely brownies on Tastespotting and they look great. I have an idea, though. Rather than adding cinnamon to the batter, couldn’t one substitute the sugar and chocolate with Mexican chocolate; the kind used to make Mexican hot chocolate? There’s a pretty popular brand called Abuelita that can be found at most major grocery stores in the “ethnic aisle.” Do you think it would work? Those brownies look good! I really like the sound of all of that cinnamon in them! My boyfriend made these for us a few days ago and my strong aversion to brownies has been lifted! These are incredible. The chocolate and cinnamon combo is a favorite, and – needless to say – so now are these brownies. I made these last night to bring to a party this afternoon. Chili, including vegetarian, on a cold, wet midwestern afternoon with Mexican brownies! Yum. They went over big time. I used 2T of good, fresh cinnamon and think next time I’ll add a little more. I’ve made these twice in the last two days. For some reason the combination of the cinnamon and brown sugar glaze really hit the spot. Thanks for posting this awesome recipe!